Generally speaking, we know where flexography is heading: Higher quality, less waste, faster machines, quicker time to market, etc. It’s the specifics that elude us. But what if you could sneak a peek at the future and see what advancements were down the road, know where to invest and even help shape those products that are coming soon? For Costa Mesa, CA based FTA member Trisoft Graphics Inc., that’s all possible, thanks to the company’s history of serving as a beta tester, which “offers us a tiny piece of the crystal ball we all would like to have,” says Director of Operations Randy Mayer. Here, Mayer talks to FLEXO about his company’s work with preproduction prepress, why Trisoft beta tests and what benefits it affords. FLEXO: How old is Trisoft Graphics Inc.? Randy Mayer: Our company was established in March of 1993. 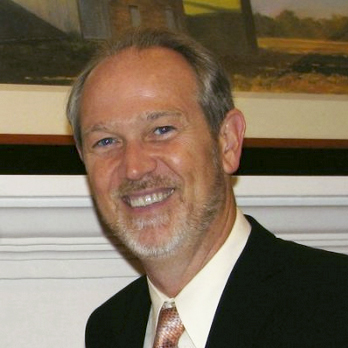 FLEXO: Talk about Trisoft’s history. What are some notable events in its life? Mayer: Trisoft has been an industry leader and innovator from the start. Back when flexo digital plates first came out, Trisoft was the first prepress provider on the West Coast to produce them, the first on the West Coast to adopt the Creo Thermoflex Digital Plate Setter from Kodak and the first to adopt the Cyrel Digital FAST system from DuPont. We were also the first on the West Coast to adopt the Kodak Flexcel NX system, and have been a pioneer of technology and expertise in virtually every major growth phase of the packaging industry. FLEXO: How large is the company? Mayer: We now have 28 team members and growing. FLEXO: When did Trisoft first become a beta tester? Mayer: For the past several years, Trisoft has been an official beta tester for Kodak’s Prinergy Workflow, InSite Prepress Portal, ColorFlow, Prinergy Layout Automation, Pandora, Tiff Assembler Plus and a host of plug ins. In addition to Kodak beta testing, Trisoft has also done beta testing for Opaline, Hybrid Software, Screen efi, GMG and Esko software offerings. And since before the term “beta tester” gained widespread use, the Trisoft team has been consulted for input by vendors across the packaging industry in prepress production and flexo plate making. FLEXO: What does the company get out of beta testing unreleased products/services? Mayer: After beta testing a product, if we don’t already own it, we may end up purchasing based on our beta experience. If we do already own it and we are beta testing an update, it is a great opportunity for us to add our two cents in the way features are applied. This win/win scenario continues to strengthen our partnerships and improve the way we do business. 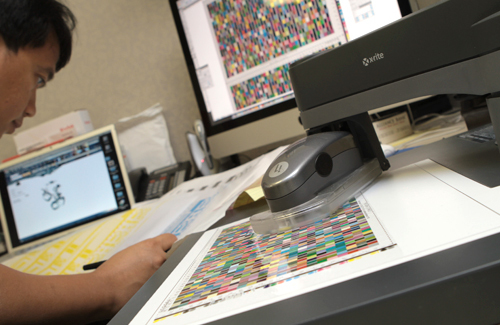 FLEXO: How do you ensure that beta testing doesn’t inhibit your operations? Do you run technologies you are beta testing alongside proven technologies for comparison? Mayer: Whenever possible, we run our betas in tandem with our production processes. When it is not possible, we make sure we have on call support from the vendor and we take special care to back up all of our processes and files. If there are features we know we will be comparing, we set aside representative files that exist from our current production processes before we perform any upgrade. FLEXO: What do employees think of being a beta tester? Mayer: Certainly there is a tendency for employees to see the constant beta testing as a ”favor” with no benefits, not to mention an interruption to their routine. If handled correctly, however, the collaborative benefits and ability for the employee to have input in the process fare outweigh these initial reactions. Quite often, a beta – especially an update – will resolve issues that were occurring in an earlier version. This is almost always something employees can embrace and often, it is an issue they brought up to start with. FLEXO: Beta testing obviously gives you a look at what’s coming next. Does that play into the technologies and software you choose to invest in? Mayer: No question. There are times when we may be looking at alternatives for a new technology and a beta test for a new software or an update will come along and do exactly what we are searching for. In the case of an update, this makes a new purchase unnecessary. 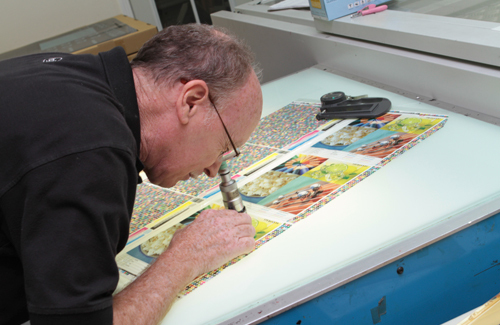 FLEXO: You’ve won Best of Show honors in FTA’s Excellence in Flexography Awards five of the last six years. Do you owe any of that to your beta testing endeavors? While it is difficult to point to beta testing as a particular percentage of our success, it is an important factor in our vendor partnerships and our ability to stay ahead of the curve. We are always mindful of customer demands, even the ones we aren’t immediately able to fulfill. We actively seek out solutions and when we see something that fits we move on it. Top: Terry Clark, sales manager, reviews a press target. FLEXO: What are some of the technologies you’ve beta tested? Which, if any, have you gone on to adopt once they were finalized and made available for sale? Mayer: All of the Kodak software mentioned here is part of our current workflow process. Future Kodak offerings that are on our testing horizon include new versions of InSite and Prinergy, as well as InSite Creative Workflow and Asset Library, and GMG Proofing Software. Quite often, our beta testing of new products does not lead to a purchase, but it always leads to a stronger vendor relationship and to improvements in the product. FLEXO: Walk through a typical timeline beta testing a technology – How does the partnering with a supplier begin, how long does it typically last, what goes on during the beta test period, etc. Mayer: It is critical to have a solid point person “process owner” who is available for questions and support at all times. The beta testing we have done typically lasts for a period of four to eight weeks, although some less involved updates or plug ins can take as little as two weeks. The process nearly always begins with a demo of the software to see if we want to actually do a beta of the product. If it is an update, this is usually not necessary, since we already have a basic understanding of functionality. Once the beta testing starts, anywhere from two staff members to the entire team is tapped for input as the testing moves forward. Frequent updates are normally shared, since it is often possible to generate a patch or beta drop to correct an obvious issue while the testing is happening. This is incredibly valuable to both parties, since it eliminates the need for another version to be sent out and this has major impact on time to market. At the end, a full summary of features tested and subsequent results is recorded and sent to the process owner with any final recommendations and/or feature requests. FLEXO: What have you learned from beta testing? Mayer: The power of collaboration is undeniable. But on the flip side of successful beta testing is an important lesson about having the time to devote. When this is the case – and it has happened on occasion – the beta does not result in the benefits to either party that are evident in successful testing. It is better to decline a beta testing opportunity than to have no time to do it and offer no real input at the end. FLEXO: Does your beta testing work help to advance the industry? Mayer: Absolutely. Whether we purchase the software or not, our input is always a benefit to the developers, to us and to the industry at large. FLEXO: What competitive advantages does beta testing afford Trisoft? Mayer: Staying ahead of the curve would be easy if we could see in the future. Beta testing offers us a tiny piece of the crystal ball we all would like to have. All the benefits of being an integral part of the development of the products we use are magnified when we add the predictive abilities and early adoption opportunities that come with being a beta site. 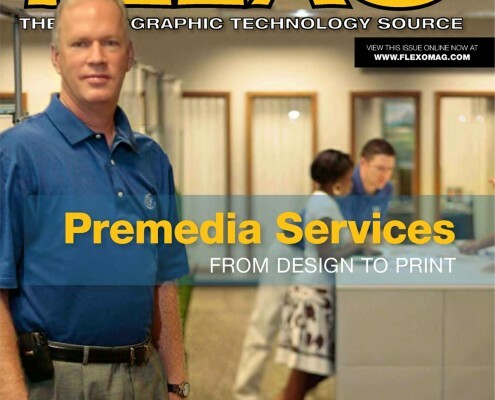 FLEXO: you refer to your company as a “boutique” prepress provider. What do you mean by that? What does Trisoft offer that classifies it as such? Mayer: Boutique by definition indicates a company that serves a specialized clientele with specialized product. We have specialized ways of doing things that make us different from other premedia service providers. 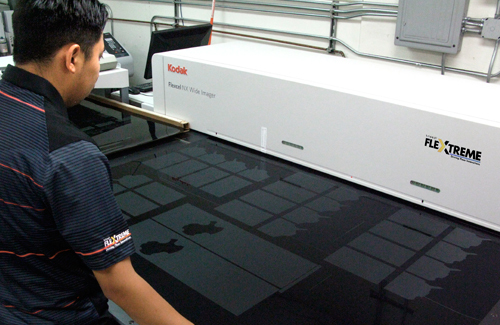 Our product’s quality is a lot higher than traditional prepress providers. We are not about quantity, but all about quality! This is what separates us from the rest. Eizo Monitor and GTI D50 Viewer. Staying ahead of the curve would be easy if we could see into the future. Beta testing offers us a tiny piece of the crystal ball we all would like to have. FLEXO: Do you find that things seen in whatever you beta test follow customer demands for new capabilities, or do the companies you beta test for think up new capabilities, which then spur customer demands? Mayer: The former is usually the more common scenario. We are always mindful of customer demands, even the ones we aren’t immediately able to fulfill. We actively seek out solutions and when we see something that fits, we move on it. It is also common for new capabilities to result in offerings we take to the customer, unsolicited, if we see something that will benefit them or them and us. FLEXO: Go into some of the specifics of what customers are clamoring for in 2015 – turnaround time, dot type, color concerns, tolerances, expanded gamut, etc. Mayer: Turnaround time and match to proof are at the top of the list for most of our customers. We pride ourselves in our continuous improvement efforts and these are two specifics we are always looking for new and better ways to address. Sometimes we can kill two birds with one stone as we develop automated systems to improve turnaround time, but also remove touchpoints for us in the process. This not only improves our turnaround, but our error rate and material waste as well. All of this, of course, has a positive impact on the satisfaction of the customer. 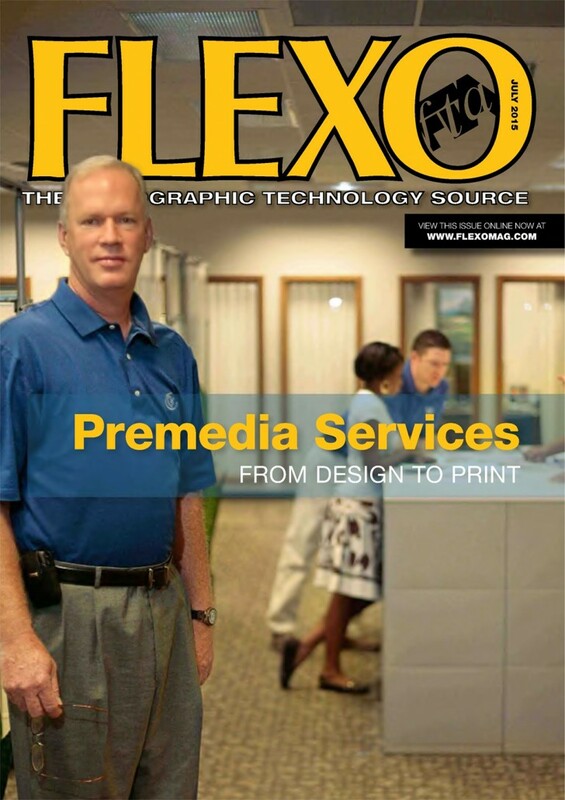 FLEXO: What does Trisoft do to respond to those demands? Mayer: Whether it be turnaround time, color matching on press, handling difficult image requirements that require advanced techniques and technologies, or just day to day demands, superior customer service is our mandate. 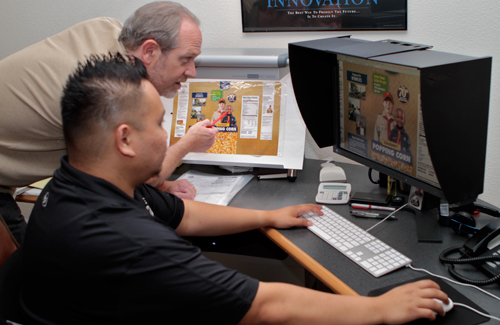 Each of our team members understands their role has a customer service component, from answering that first call or email, to extensive preflighting and engineering of the job, to advanced prepress production and optimization, to our unique plate making process – Our team is always looking for better ways to serve our customers. Of course, this includes bringing new technologies and techniques to them as well, not just implementing them internally. In this way, we see our customers as partners, and that is what keeps them coming back to us.